The Australasian Survey of Student Engagement identified that 27% - 34% of university students intend to drop out of university prior to completing their degrees. I know what it is like to have the strong desire to drop out. I took 7.5 years to complete my first degree which was supposed to take 4 years. The last 3 years of my program seemed to drag on forever. Every semester I would seriously consider quitting. My partner (now wife) kept urging me to stay course. "You won't regret it!" she urged. Truth be known I wasn't the greatest student back in those days! 'P for pass' was my mantra. Hardly a mantra for success! Got a job in a field related to my studies because there weren't any jobs available and unemployment had reached 11%. The fact that I had completed my degree definitely mattered when it came to getting my first job because I was competing with other folk who also had degrees. My part-time work experience in the fitness industry also mattered. It was this experience that taught me that my partner was right. Completing my degree did matter even if I didn't get a job as a teacher. I learned that, to a large degree, my qualification was like a bus ticket. There are certain buses that you just can't get on if you don't have the ticket. For a number of years I continued to swear that I would never go back to university. However as they say, you should never say, "Never!". Toward the late 1990s my career had taken off and I had reached the senior levels of the organisation for whom I worked. But I had hit the glass ceiling. Unless I continued my education and gathered some more tickets then my career options would be limited. At the end of 1999 I decided to enrol into my first post-graduate program and commenced that program in July 2000. As a Distant Education student who was working full time it was a real challenge. Balancing work, play and study was difficult. To add to my challenges I had become a first time father in January 2000. I had bitten off a lot! Maybe this story resonates with you? However between graduating from my teaching degree and commencing my first postgraduate studies I had become a student of leadership. I had been doing a lot of reading about leadership and success and had discovered that I had far more control over my success than I had realised. And I put what I had learned into practice throughout my postgraduate studies. After graduating from my Graduate Diploma in Human Resource Management I immediately enrolled into a Master of Management program. My grades averaged a High Distinction and I loved the learning experience. All the while I was working full time and by the time I completed my Masters program we were about to have our third child (I now have five children!). I understand what it takes to complete a degree when working full time and having significant family commitments. I also understand how managing your energy contributes to your ability to 'manage' when you have competing demands on your time. Which is why I want to share my ebook "Energy For Success - Seven Steps For Generating The Energy You Need For Success." with you. 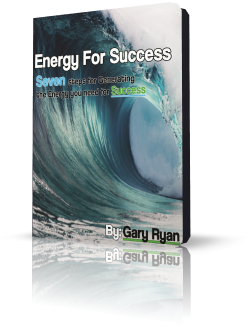 My complimentary ebook walks you through a simple seven step process where you will be able to quickly identify the key elements that generate energy for you, and which elements in your life drain your energy. You will then be able to create a re-enforcing cycle for energy that will enable you to have the energy to be a success throughout your postgraduate program. One of those steps involves identifying the times in your life when you have felt full of energy and been able to perform at your best. What factors were present when you felt like that? What was it about those factors that seemed to really matter? For me, I know that feeling fit and healthy gives me the sense of being able to tackle any task, no matter how big or small it is. When I don't feel fit and healthy it is amazing how challenging even the smallest task can seem. So, it would seem that being fit and healthy is a key factor for my energy. And it is. What are your examples? Once identified these factor often relate to each and provide you with amazing insights about what you should and shouldn't do to ensure that you have the energy to complete your program. If you'd like to learn more and be able to create your own cycle for generating your Energy For Success simply click this link and follow the prompts. Gary Ryan helps individuals, teams and organisations move Beyond Being Good.